Not many people look forward to going to the doctor. In general, hospitals and doctors offices are places that people would rather avoid. Many medical offices and facilities recognize this fact, and they go to great pains to create waiting rooms and seating areas that put people at ease and reduce their stress. Just this past week we were in an office that not only supplied the usual set of interesting magazines, but they also played calm music, and even served food and beverages. And these things did help a little. 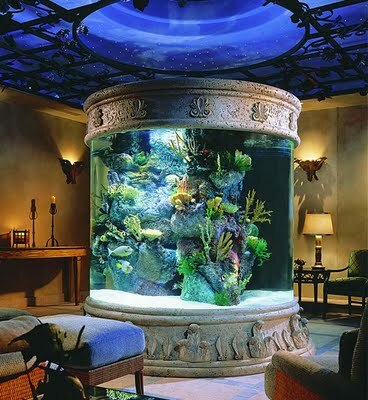 But lately, medical offices are becoming aware that one extremely effective way to create a soothing and relaxing environment is to install an aquarium. 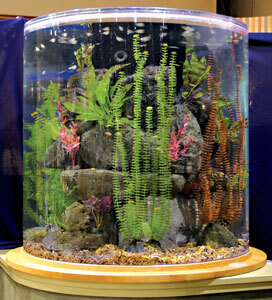 Recently, we were contracted to design a 400 gallon aquarium in a medical facility. This will be a cylindrical aquarium, which means that the tank can be seen from all sides, and creates an awesome visual picture. Each person in the room can watch in wonder the enchanting world of aquatic life. As patients wait to be seen, they can bask in the beauty and peace of this underwater world. We, as always, are delighted and honored to be a part of providing a better life for people - a life filled with beauty and joy and peace. We love what we do, and are so glad to bring a piece of that peace to those who have need of a doctor. An All Bright Pond decorated for Fall. New pond and waterscape in Minerva NY. Custom Aquariums And Outdoor Water Garden design, installation and maintenance in Albany, Glens Falls, Plattsburgh, Saratoga NY, Burlington VT & the Adirondack Region.